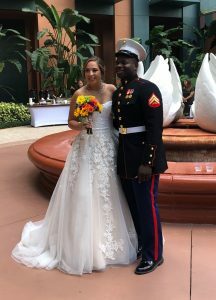 Standing their in front of their family and close friends he in his dress blue and she in a beautiful lace bridal gown, they recited their vows, exchanged wedding rings and became husband and wife. The talented ladies of Just Marry coordinated the day’s festivities. Randy Chapman photographed every detail from the arrival of the guests through to their reception. Raining Roses crafted a beautiful bouquet of bright colored roses, sunflowers, and daisies to add that touch of color to the ceremony. Rev.Glynn Ferguson with Sensational Ceremonies worked with the couple to create a custom ceremony that spoke of love,friendship, loyalty, fidelity, and trust. With traditional vows and a simple ring exchange, it was just way they wanted it.